The main function of a house is to protect its inhabitants from the weather, but unfortunately, modern houses are often built without keeping some of the most important basics in mind. Energy-saving houses aren’t just flashy, fancy labels or a trend—the basics of house building that’s in line with how nature works are as old as time itself. 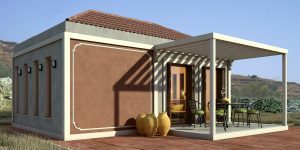 Ideally, you’d be building the house that lets you stay warm during the winter months, while at the same time capable of sheltering you from the harsh sun during summer. The balance of the temperature inside of your house comes down to constructing an ideal space to keep the temperature comfortable with minimum use of thermostat. Here are some of the most important things to keep in mind to build constructions that could help you so much in cutting down energy cost. House orientation with sun as the guide is an age-old method when it comes to dwelling constructions. It has a great impact in house cooling and heating. Temperatures inside the house often depend greatly on sun’s orientation. This is the most important step, especially when you’re building a home from scratch. In the US, rooms that face South will allow the most sunlight to come through. Remember an appropriate overhangs that will protect you from the summer sun that still allows for the sun to transfer its warmth during the winter days. A well-insulated house does not simply keep the insides warm during winter—it also helps reduce the impact of the sun’s heat during hot weathers. All of the exterior walls need to be insulated, as instructed in all building codes. One of the most commonly used insulation is fiberglass. It is an excellent material as an insulator and it’s also known to be resistant to fire. Aside from the exterior walls, foundation walls, attics, and slabs for houses that doesn’t have basement space are some of the most important places to insulate your house. If you’re building a house from scratch, make sure to research, consult with your architect, and insulate according to your house’s designs. Cross ventilation is also known as the wind effect insulation. This method has been present long before air conditioner or even fans are invented. It’s a straightforward natural way for cooling, as well as to make sure the inside air of your house is circulated well. Ventilations are important not just to keep your rooms cool, but also to ensure the quality of your indoor air. By allowing natural air and wind to flow through your house better through cross ventilation, the cost of air conditioner could be reduced well.